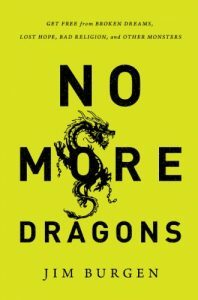 Jim Burgen’s, No More Dragons, from Thomas Nelson Books. His sermons (while at Southland Christian Church in Kentucky) were instrumental during my college years, and this book has taken it a step further with messaging that centers upon curing a hardened heart. Jim challenges the reader saying: becoming a dragon is a dangerously sneaky process. He uses the C.S. Lewis novel, The Voyage of the Dawn Treader, as a fitting example of a boy becoming a dragon unawares. The boy finds treasure, falls asleep on it, dreams, and awakens as a dragon concerned for his treasure hoard. Upon awakening, he discovers he cannot remove his dragon scales without the help of Aslan the lion, protector of Narnia. This is a status most of us (if we’re honest) would like to reach at some point in life: un-dragoned. Have you ever felt this freedom? Free of the past. Hopeful for the future. Very much alive in the present. When we can look in the mirror and not see a monster staring back, is a good day. What will get us there? Is there a moment when you can assuredly say you’ve arrived?